ACCORDING to Mount Perry's Brian Gerdes, the bushranger spirit never left the old copper mining town. There is more than one Ned Kelly fanatic lurking around that he knows of, so Mr Gerdes think he's onto a winner with his latest Men's Shed creation. The painted 60cm statue of the iconic Australian bushranger will be auctioned at the upcoming Mount Perry Axemen and Sawyer's Club annual charity auction event. No Ned Kelly would be complete, of course, without the armour, which Mr Gerdes created using an aluminium street sign, while the face mask was made from a 1930s diesel piston. 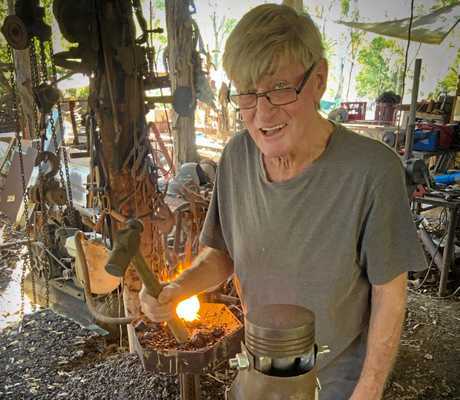 Once complete, the statue will be on display at the auction's venue, the Mount Perry Grand Hotel, ahead of the Saturday, April 6 event which will be hosted by comedic Dingle duo, Mick and Peter, who put the crowd in stitches each year, Mr Gerdes said. This year marks the 20th anniversary of the auction and Mr Gerdes, the club's secretary, has been there for them all. "We decided to do it because everyone was trying to hang on and get a quid,” he said. Last year marked another important milestone for the auction, as it passed the $100,000 mark raised for charity since the event started. Mr Gerdes supports the auction in more ways than just organisation. "I've bought some crap over the years,” he said. Mount Perry Men's Shed's Gavin Murray is also a fan of the event. "It's very entertaining. It's not so much about the stuff they sell, because that tends to be a mix of trash and treasure, but (the Dingles) are very funny,” he said. Mr Murray was also full of praise for Mr Gerdes' handiwork. 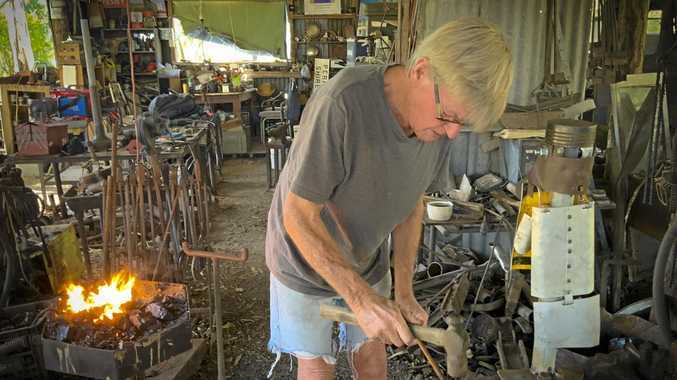 "I've seen some of the things he's made and he is very talented,” he said. 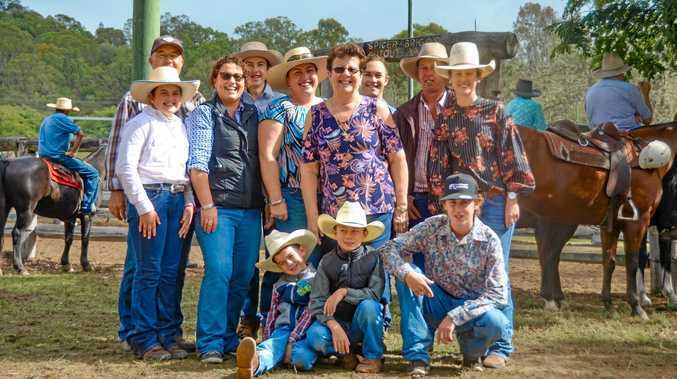 Each year, the club chooses a different organisation to be the beneficiary, from the Ronald McDonald House Charities to Bundaberg Rotary Lodge and Energex Rescue Helicopter. The town has a particular affinity with the latter service. It has airlifted several seriously ill residents, and the club has donated the auction's proceeds on several years to the service - a total of about $27,000. In 2014, the club donated $6301 towards the completion of the town's skatepark and won an Australia Day award the following year. This year, the funds will go toward drought relief, most likely the Drought Angels charity which offers personalised support to farmers and their families. Evolution Mining, owner of the nearby Mount Rawdon gold mine, has donated about $1000 worth of Bunnings Warehouse equipment to be auctioned off at the event. The auction will be held at the Grand Hotel from 5.30pm on Saturday, April 6, and a sausage sizzle will be on offer for a gold coin donation.